Leader Valley Primary School in Earlston's new learning swing, purchased thanks to a �6,000 donation from the Borders Children's Charity. Children with complex needs are getting into the swing of things at school thanks to a £6,000 donation from the Borders Children’s Charity. Pupils at Leader Valley Primary School in Earlston now have their own learning swing, and it’s proving popular in the playground. The school, opened at South Croft Park in 2017, provides enhanced provision for children with complex needs arising from autism. Pupils were moved from Wilton Primary in Hawick and St Ronan’s in Innerleithen to the purpose-built facility. And although the £1.7m school, complete with calming classrooms, soft-play area and sensory room, has been welcomed by staff and pupils, there was something missing when they first moved in. Principal teacher Claire Ogilvie explained: “We arrived at our lovely new building with wonderful outside space and realised quite quickly we could do with a swing because the children really like that motion. 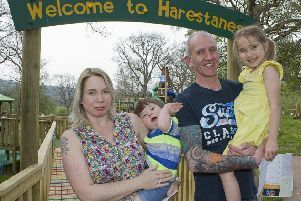 “With the groundworks needed and the equipment, the swing cost around £6,500. Borders Children’s Charity chairperson Rebecca Dolby said: “We were more than happy to provide funds for the swing because it goes along with our ethos, which is all about relieving distress in children in the Borders, whether from poverty, disability, sickness or anything else.